With this “point to point” race you will start at Village Creek State Park and finish in downtown Forest City. A “point to point” race means you Swim from point A to B, Bike from Point B to C and Run from point C to D.
Enter the swim at the boat ramp at Lake Dunn, swim the 1/3 mile and exit at the other boat ramp. You will run / walk up the boat ramp to the Transition area #1 (T1) and put on your helmet, shoes, sunglasses (optional) and mount your bike. 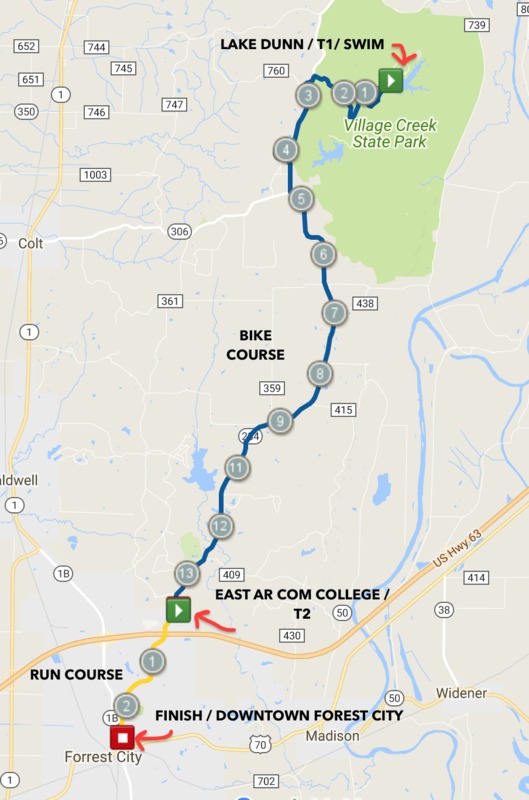 The Bike will be a rolling 13 miles and take you to Transition #2 (T2) at East Arkansas Community College. You will dismount your bike and rack it beside your running shoes that you left earlier in the morning. You will take off your helmet and put on your running shoes, race bib number, and hat (optional) to head out on your 3 mile run towards downtown forest City to the finish line. Post Race – you have options of taking the Buses back to your car, running and biking back to your car, or hitching a ride just make sure you come back to the finish line area to partake in the post race food and awards activities. Arrive at East Arkansas Community College to pick up your race packet. This is also the location of T2 (Transition #2) where you will leave your running shoes, race number (can be on a race belt or a shirt) and a hat (optional). You will now drive the 13 miles to Village Creek State Park to the swim start and Transition area #1 (T1) Pay attention to the hills and landmarks along the way because you are driving the bike course in reverse. You will park your car in the grassy area. Find a safe place to leave your keys. Pump up your tires, grab your Helmet, Bike, Sunglasses (optional), swim cap, goggles and transition plastic bag provided by S2F and ride or walk up the hill to the start line and T1. Post-race you can take the bus back to the parking area to get your car and then collect your gear from T2. You will want to park a car at the finish line so you can have transportation back to T2 and the start / parking lot to pick up gear and the car you drove at the start. This will save waiting for the buses. If you have fans with you they can take you to Village Creek State Park to check in and pick up your packet and then drive you to the start line to drop you off. They should then drive to the finish line to watch you finish. This is not a real spectator friendly course. If your fans stay to watch the swim they may not make it to the finish line prior to your finish because they will be driving the race course and it is hard to drive alongside the bikers on the road.